Daniel Day-Lewis declares "Phantom Thread" will mark the end of his acting career. I hope not; but if so, he leaves on a high note. Set in 1950s England, Day-Lewis heads a London fashion house. He creates ball gowns and fancy dresses for the elite. Day-Lewis portrays the designer as an artist. He must have quiet. His every need must be met. Lesley Manville plays the designer's manager, sister, and enabler. As the story begins, his latest mistress is dismissed, for interfering with the master's concentration. On a trip to the country, he meets a country waitress played by Vicky Krieps. He brings her home, creates a dress for her, and installs her as his new love. Will brother and sister force her out as before? This time, when the old pattern gets a twist right out of an Alfred Hitchcock thriller. 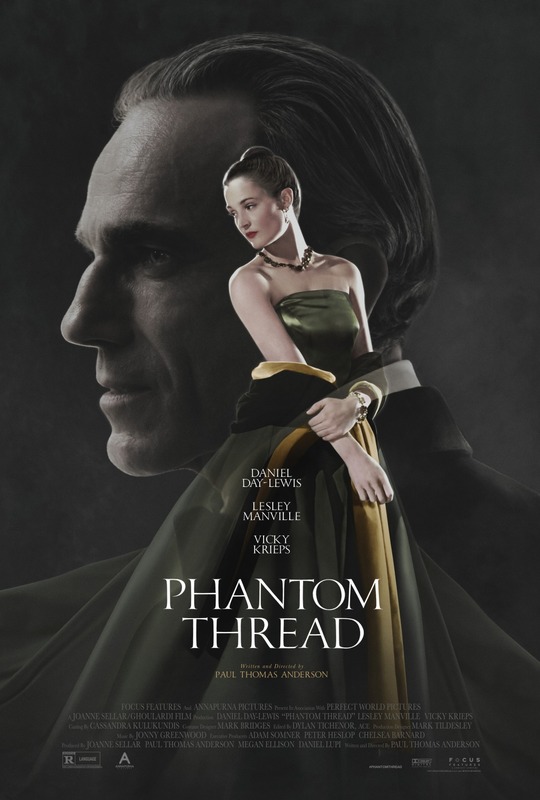 "Phantom Thread" looks beautiful. The interiors and set design make your eyes pop. The jazzy musical score by Johnny Greenwood sets a perfect mood. The triangle of Krieps, Manville, and Day-Lewis hums. The plot twist made my jaw drop. I left "Phantom Thread" satisfied. "Phantom Thread," 4 stars, rated 'R'. Does it deliver what it promises? Beautiful, weird thriller. Is it entertaining? Holds your attention. Is it worth the price of admission? One of the season's best.